The printers are going into standby and eventually shutting off because they are not receiving the correct signal from UCCNC that the machine is running. This is a very simple fix outlined below. 1.) 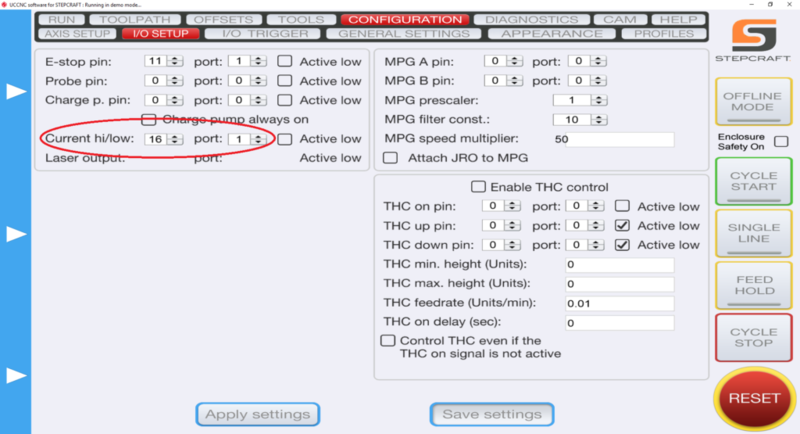 Define pin outs in UCCNC –> CONFIGURATION –> I/O SETUP. On the left hand side you have “Current hi/low”. Those two pins should read “16” and “1”. 2.) Define pin outs in UCCNC –> AXIS SETUP –> SPINDLE. Bottom Left you have “M3 relay pin”. 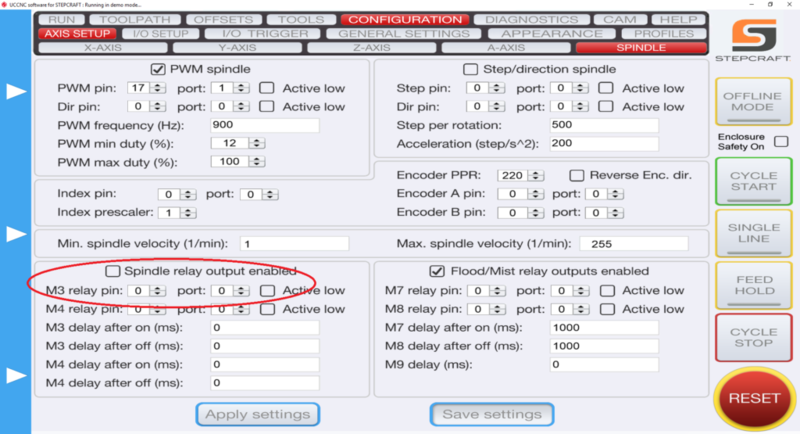 Change those values to “0” and “0” and uncheck the “spindle relay output enabled” if it is checked. What software is needed if I purchase the 3D Printer attachment? You do not need any additional software. The 3D Printer attachment comes with Repetier Host slicing software to create the GCode for the the 3D print files. That file is then run in UCCNC which comes with the STEPCRAFT CNC machine. What is the maximum project height I can 3D print? If you are using the STEPCRAFT Heated Bed, then you need to subtract 17mm (.67″) from the total print height. What are the Parameters for the Stepcraft PH-40 Printing Head in Cura? Cura does not come with the Stepcraft PH-40 as a pre-configured printer, and thus requires creating a custom printer profile (please see the PH-40 First Steps UCCNC manual for more information). Below is a PDF containing the parameters for your Cura profile. Please note that the nozzle diameter setting is dependent on what size nozzle is fitted to the print head. Does the Laser DL445 use the same port on the STEPCRAFT as the 3D Printer and HF500 spindle? Yes, they both use the same serial port on the back of the machine. You would need to disconnect the cable and reconnect the attachment that you wish to use. STEPCRAFT also offers a Switchbox which allows you to connect everything and simply turn the dial to select the attachment you wish to use. This is very handy if you are constantly changing attachments. Does the 3D Printer come with filament? No, it does not. We suggest that you purchase filament from www.matterhackers.com. You will need standard 1.75mm filament. Does the 3D Printer attachment fit all size machines? Yes, it will work with all Version 1 and Version 2 STEPCRAFT CNC machines. Do I need to buy additional software if I am only buying the Machine and 3D Printer attachment? No, since UCCNC is included with the machine to run the G Code and the 3D Printer attachment comes with Repetier-Host slicing software. Those two programs are all you need if you are just going to use your STEPCRAFT CNC for 3D printing. 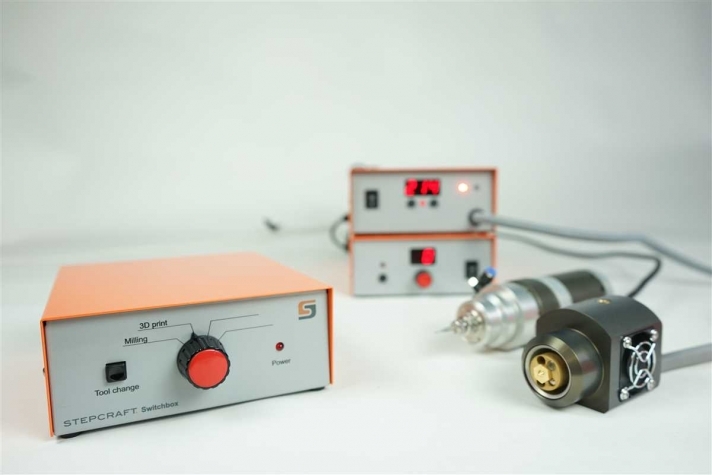 If you are going to use the machine for cutting (spindle, laser, drag knife, etc.) then you need to have a CAM software program as well. Can I use a 3D scanner to create 3D models to carve as well as 3D print? Yes, models created with a 3D Scanner are typically saved in common 3D formats like a .stl. These files can be imported into CAM programs like Vectric Cut 3D, Vectric V Carve and Deskproto where they can be assigned tool paths to carve the object out of a material. This is commonly done with two tool paths: Roughing and Finishing, using a standard end mill and a ball nose end mill, respectively. These files created from a 3D scanner can also be used for a 3D printer. Can I connect my HF-500/MM-1000 spindle and 3D printer to the STEPCRAFT at the same time? Yes you can with the use of the of the STEPCRAFT System Attachment Switch Box. 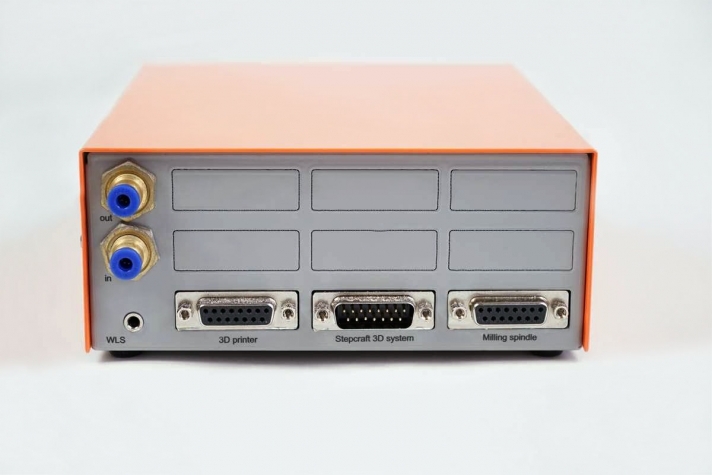 To use the Switch Box, you simply plug a serial cable from the Switch Box to the serial port on the CNC and then you plug the 3D Printer and the HF500 Spindle into the respective ports on the back of the box. Then you can just rotate the dial to select the attachment that you would like to use and mount that attachment into the tool holder on the STEPCRAFT. Are there any specific 3D Scanners that work best with STEPCRAFT, or any other CNC?